Ole'. Use it as a dish or share as a starter. This quack-tastic recipe will keep you waddling, in your search for more!! In a pan, heat the oil and seal the duck on both sides. Once sealed place into a half gastronome with high sides. In a large jug mix the Knorr Mexican Chunky Salsa Mild, KNORR Concentrated Liquid Stock and water. Pour over sealed duck, top with a lid and place in the oven on 160 degree Celsiusfor 2 hours. Once cooked – remove lid and carefully remove the duck from the liquid. Allow to cool a little and then shred meat. Set aside ready to use. 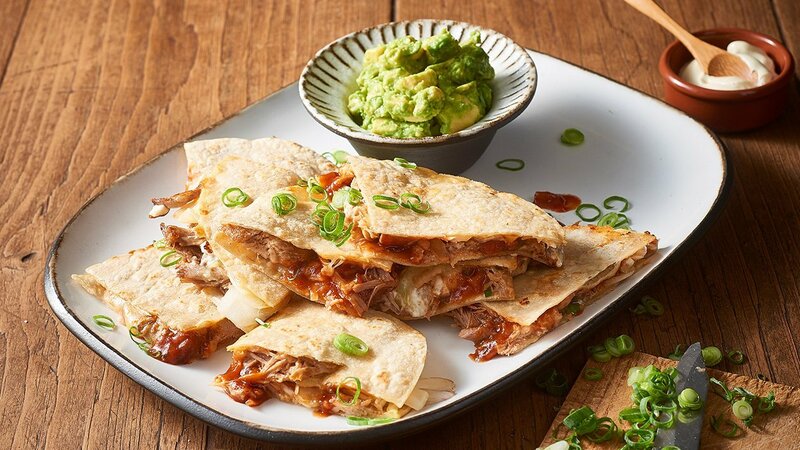 Take a tortilla, add cheese, shredded duck, eschallots, coriander, goats’ cheese and KNORR American Chipotle BBQ Sauce GF, topping it all with a second tortilla. Move to heated pan and toast both sides until golden brown and cheese is melted. Repeat these steps until all quesadillas are used.